My Schedule is a fast way to see what events you have planned for today, tomorrow or any day! This will allow you to see all of the planned or completed data for today. Scroll down the page to see all of the actual events, and what data is/will be captured for those events on that day. If you have an event that has been scheduled for you to enter, click on the name of the event to be taken to the actual entry (as shown above). 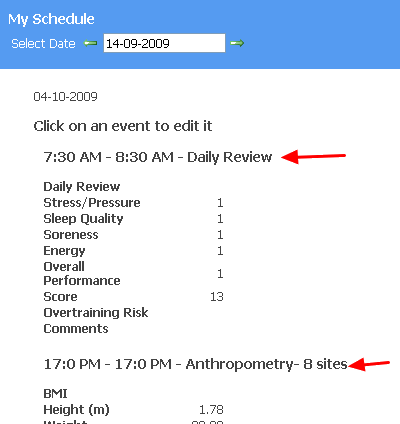 For this example we are going to click on the Daily Review Form. The event was scheduled and is marked as "Planned" ( a draft event). Complete the event, and click on the "Save and Close" button. 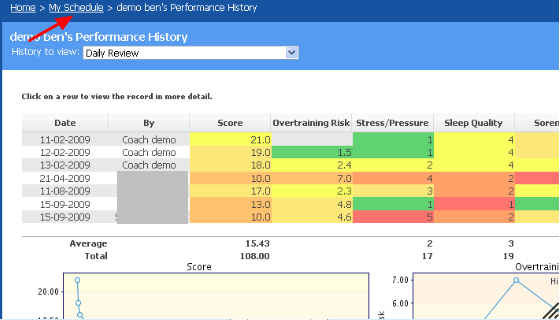 The information will be saved a completed, and this event will then be saved on your records, and only coach with access to this information will be able to access these results. Click on the "My Schedule" link and go back without changing any information on the event. You will be asked "Are you sure you want to lose all changes?" click the OK button. If you select to save and close the event, you will be taken to your History page to see your results. If you selected to enter data into your event and then save and close it, the system will automatically take you to your history page where you will be able to see how your new entry compares with any other information that you have entered on the system for this type of event (e.g. Daily Review). 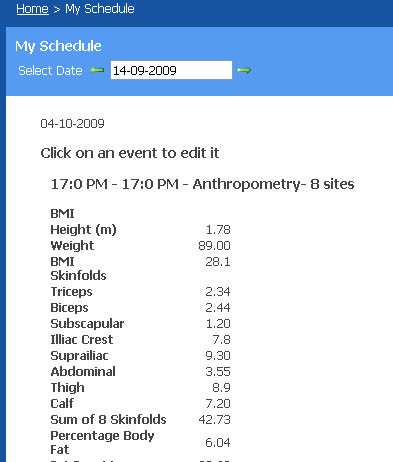 To go back to the My Schedule page, simply click on the "My Schedule" shown in the trail bar at the top of this image. Click on the green arrows to move forward or back one day from the date shown (#1 Left arrow moves back one day, #2 Right arrow moves forward one day). 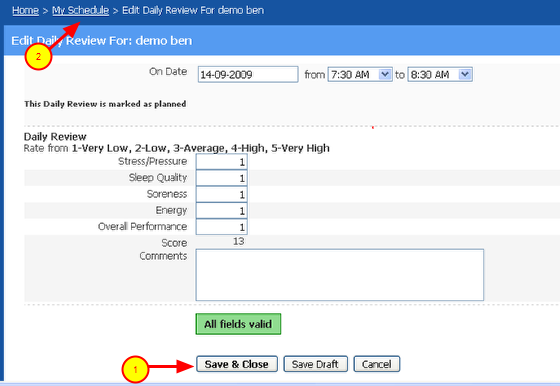 Alternatively, click on the date box, and a calendar will appear for you to choose a date. Use the small blue < and > arrows to skip between months (#3 and #4), and the << and >> (#5 and #6) to skip between years. 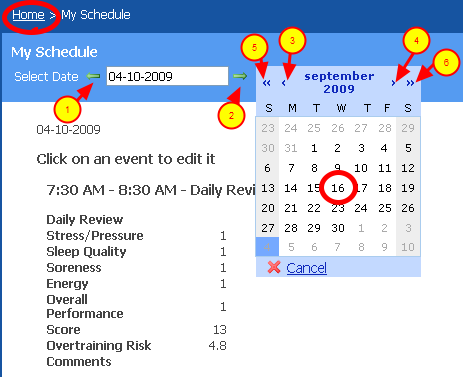 When you have found the correct date, click it and any events scheduled for the selected day will be shown. To go back to the home page, by clicking the Home link as shown in the image above.